I have these legs from a 50s (or 60s) stringmaster and one started slipping so I opened it up and saw 3 rings which I think could be “clutches”. In my infinite wisdom I opened up the second leg to compare to a perfectly working leg, and now I have 2 problems. The second clutch thing broke off and it was only 2/3rd the circumference of the leg to start, I’m guessing the other 1/3rd fell off and was lost long ago. I searched the forum and heard about using a wooden dowel cut to size but I’d just like to fix these so I can adjust to any length (just as they would function new). Any idea of where I can get the pieces for this? I could open a third leg to look at but my track record with that method is 0-for-2. Clutch kits for the old Atlas mic stands are supposed to work but they seem to cost almost as much as new legs when you can find them. Forum member Basil Henriques mentioned that he was planning to start making them a few months back. You might check with him. Please report back with what you eventually find! I have the same problem also on 2 legs of my 1956 Stringmaster T8. Jim Palenscar of Steel Guitars of North County can rebuild them. I bought two Atlas repair kits from B&H Photo. They are not cheap anywhere but B&H had the best price. Two Fender fretless Jazz Basses, Martin D-18, Martin DXK2, Taylor 812CE, Gretch White Falcon, 1944 Epiphone Zenith, a killer Luttrell 6 string resophonic, 1932 Model 56 Dobro, Beard Model E, Benoit 8 string, converted to 6 string resophonic, Martin Soprano Uke, 1948 Rickenbacker NS, a 1954 Fender Professional Dual Six, in the hands of a rank amateur, 1972 Dobro model 66, Peavey Nashville 112, Fender Bassman, Fender 75 watt Rumble, and a Fender 100 watt Rumble. Hi Michael, I appreciate the offer! I actually found a local guy Lynn Stafford who does great work. I’ll sing praises about Lynn all day long but he seems pretty busy for a “retired” guy so I don’t think he needs my endorsement! He had some old rusty legs from an Emmons and the clutches fit perfectly. He took a spinning wire brush to the socket threads and cleaned them up nicely too. There’s still one leg that is slipping so I was planning on ordering the atlas repair kit that Jack posted (thanks Jack!) but I haven’t gotten around to it. 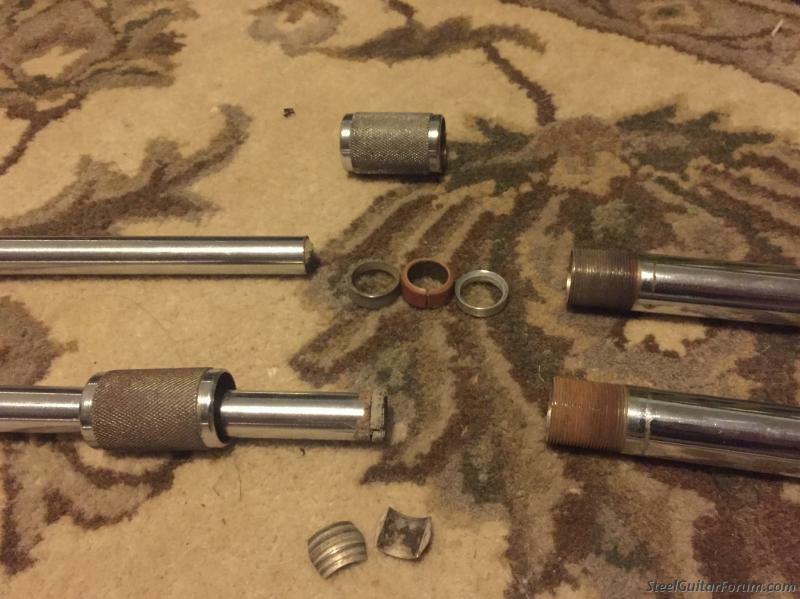 For anyone who cares, I can confirm 100% that those brown ring pieces in the picture I posted are a perfect fit to the atlas mic stand ring pieces, I heard that Emmons literally used atlas mic stands for their guitar legs. And it fits my 50’s fender stringmaster legs perfect. in the original post I incorrectly referred to the rings as “clutches” but the clutches are actually the large metal cylindrical things, which were in perfect working order. Posted 16 Apr 2018 5:31 am Lynn is a great guy! Two of the legs on the Studio Deluxe I purchased as a rescue instrument also would not hold. I took 'em apart, soaked everything overnight in Ronsonol, let it dry out for an hour or so, and reassembled. No more slippage; now they work like new. May not work in every case, but it's worth a try before you buy new legs or new parts kits. It's pretty rare that they're worn out. It's more common that there's something missing or installed incorrectly. Taking apart, cleaning and lubing usually does it. The clutches will bind on the male threads, so scrubbing and lubing them helps in particular. On some, you can flip the 3 compression bits inside the clutch. If they're really jacked up, I think I used to put an O-ring inside the little cup in the clutch. Often you can use different innards from mic stands with the original clutches even if they are of a different design. To reassemble, stick the leg extension up through the clutch just enough to have something to set the innards on. Then drop the innards in & thread the leg into the clutch from above. Thought I'd ask here instead of starting a new thread...My '53 dual 8 has a leg that is slipping. I disassembled all 3 legs, cleaned and lubed them. This has helped, but the leg that was slipping has a broken inner rubber washer. These legs only have two inner pieces, the beveled metal ring and the beveled rubber washer that it compresses. I'm hoping I don't have to buy a $25 atlas clutch repair kit for one little rubber washer. Has anyone found other places to buy these?